N.A.T. 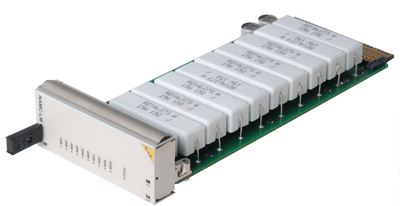 launched the NAMC-LM, a single-width, full-size or mid-size AMC load module, dedicated to simulate and verify electrical and thermal load conditions of MTCA systems and ATCA blades. The module provides switching of load conditions scalable in 10 steps (0-100W), testing of capacitive load conditions and thermal simulation within 3 heating zones. A special feature is the surveillance and configuration via NATview (Vers 2.5): visualizing and switching of load conditions during run time. Besides static load conditions the NAMC-LM provides a pulse mode simulating dynamic load conditions for testing power modules. All results are traceable in NATview. Additionally, the power level is indicated at the front panel via LEDs. For thermal verification the load module provides three zones which can be heated individually. All load conditions or thermal test programs can either be pre-configured by onboard DIP switches or be defined during run time via IPMI messages. Onboard temperature sensors continuously measure the thermal conditions. For further details please visit the web site for the NAMC-LM.